This is the largest as well as one of the most dramatically colorful agates from Patagonia I have ever had. There is a faint hairline fracture that runs across the right hand red area but it can only be seen by looking at the reflection of the surface in a bright light. Perfect husk. The nearly black grainy exterior is the biggest guide for identification of this locality. 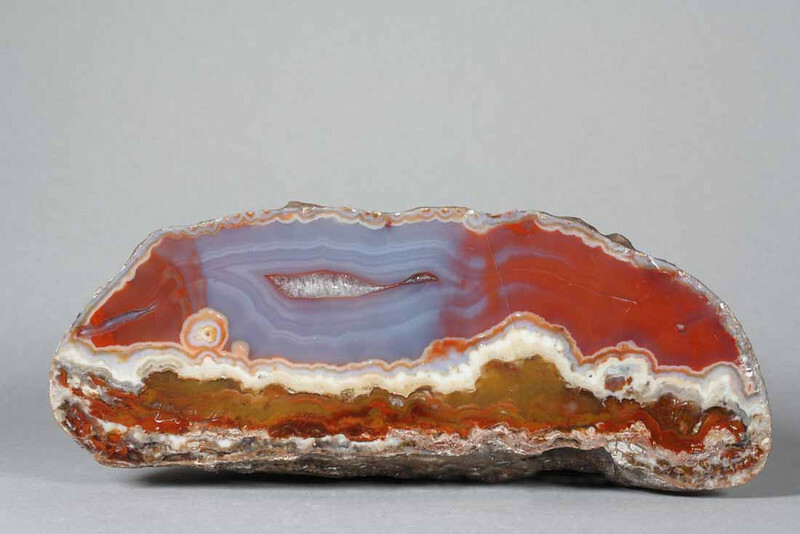 Also over 90% of the specimens are ruin agates, at the bottom there is a layer of material that was shaken from the walls of the cavity before agaitzation began. At times this layer is fully agatized but often if the specimen has been on the surface for a long time this softer layer of mineralization may have been completely eroded away by the blasting sandy winds of the Patagonian desert. Another La Manea feature is the richness of the colors, unlike the gentle pastels of Paso Berwyn or El Sombrero or Piedra Parado, for example. As well as all these features this agate also has distinct chromatography, often seen in the San Rafael area but rarely in the agates from Chubut.